The upper part of the embryo is shown here. There is still a wide opening along the back of the embryo that will gradually close over the next few days. The head and lower spine portions are the last to close. 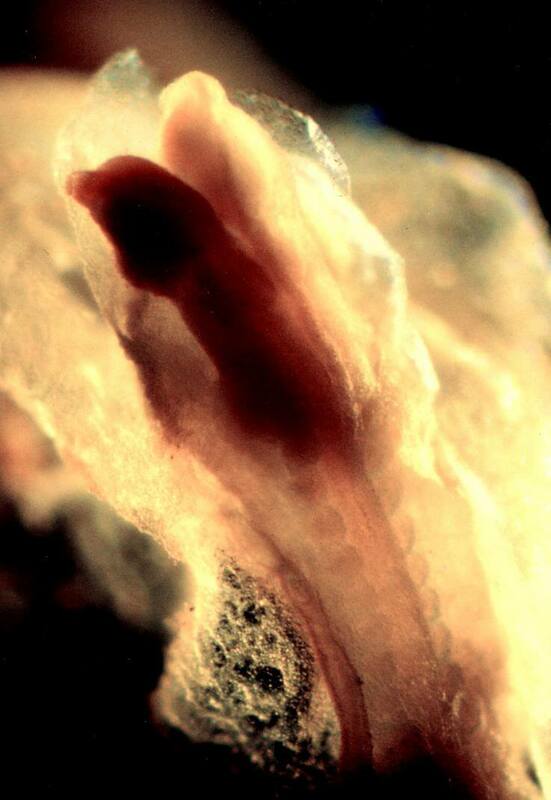 The placenta – the structure that will become your unborn baby’s lifeline – is forming. Your pregnancy test result may be the only outward sign that you’re pregnant, but there are many fascinating changes taking place inside you. The basic structures that will form the placenta are now in place. The outer layer of cells that originally entered the lining of the uterus is now coated with projections of placental tissue. It is the outer cells that are in direct contact with small lakes of your blood. The inner placental projections or fronds are termed “villi”. Some villi anchor the pregnancy to your tissues and, from these, smaller free-floating villi arise. Later, further branches will appear and ultimately resemble the branching pattern of a fern leaf. The villi are still immature and have not established a blood supply of their own. It will be several weeks before the placenta is mature enough to supply all the oxygen and nutrients that your developing baby needs. I really wanted a baby, but now I have a positive pregnancy test result, I’m suddenly not so sure. Is this normal? I felt exactly the same at first and after chatting to friends discovered that lots of them had mixed feelings, especially at the beginning. I found a good way to overcome this was to focus on the reasons why I wanted the baby. I wrote these down. Then I tried to work out what I was really worrying about. Was it the thought of giving up some freedom? Financial worries? Concerns that I wouldn’t be a good parent? This helped me to get things in perspective and realize I really did want the baby. If you have any doubts while you’re pregnant , try talking to a close female relative – perhaps your mum – or a friend. You’re likely to find that they, at times, had similar doubts, but went on to enjoy pregnancy and being a mother. As soon as you find out that you’re pregnant see your doctor, who may carry out some routine tests and can explain your options for antenatal care. The doctor will refer you for your first appointment with the midwife at about 8 to 10 weeks. Alternatively, you can refer yourself to a maternity unit. As home pregnancy tests give such accurate and reliable results, most doctors rely on these for confirmation of the pregnancy and do not follow up with a blood test. You can, however, ask your doctor to diagnose your pregnancy if you haven’t done your own test. Some doctors take a urine sample to check for urinary tract infections, or anything that could affect the health of your pregnancy. A brief medical history will be taken, noting down the number of pregnancies and births you have had previously and your family history. You may be weighed, and have your blood pressure checked. Your doctor should explain how antenatal care works and give you nutritional and lifestyle advice.